For those of you reading this article with the hopes of picking up some tips to help you consistently win money at the roulette table; I'm sorry to disappoint, but neither I nor anyone in the world will be able to help you to swing the odds into your favour. However, here are a few handy roulette tips that will help you have a more enjoyable time at the roulette table, as well as a tip on choosing the best value for money roulette game. If you have a choice between playing at either the European or American roulette tables, make sure you choose the European version every time. European roulette does not have the '00' number that the American table does, yet both games still pay the same odds. This means that you have better odds of winning at a European table than you do at an American roulette table. Roulette is a game of luck rather than skill, and the odds are always going to be in favour of the house, no matter how you play. So realise that whilst you might win money from time to time, over the long run you will be losing more money than you win. No matter how flashy or convincing they might appear, there are no roulette systems in the world that will help you to consistently win money. Games like online Craps, Roulette and Baccarat rely on luck, and there is no way you can turn it in to your favour. The only person that makes a profit from these 'systems' is the slimy salesman that tricked you into buying it. If they were really that good, they wouldn't be on sale in the first place – the person who invented it would be keeping it to themselves. 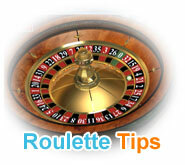 Having a gamble on roulette is a great form of entertainment, so enjoy yourself whilst playing roulette. Although you might be losing money eventually, there's no reason why you can't enjoy yourself as you go along. Soak up the highs and the big wins, and have some fun whilst your making bets at the table. Always set yourself a definite limit that you will not pass when your wagering your money. Make sure that you bet with an amount that you can afford to lose if you hit an unlucky streak, and don't go over the limits you set yourself for each session. At the end of the day, you can't lose any more than you're comfortable with losing if you are strict with your betting. If you sit down at the roulette table with $50, you're not going to get much entertainment if you're betting $50, $25 or $10 at a time. Size your bets so that you can get good value for money when it comes to time spent at the table. Bet $1 or $0.50 (if possible) at a time and you will experience more highs, lows and tension than if you risk it all at once. Roulette is more of a marathon than a sprint. It's a lot more fun to take your time to think about where you are going to place your bets and anticipate the outcome, rather than to bet carelessly and see what happens. Although the placement of your bets will not make a difference to your odds of winning over the long run, it's more entertaining to see how your carefully chosen bets will fair after the wheel has been spun. Roulette is designed for entertainment, so lets keep it that way. Enjoy yourself!